Several nights this week, I heard the weatherman mention the Perseid Meteor showers and the times to best view them. Dusk and pre-dawn. For a quick second or two I thought I should do that. It passed. Then last evening, with company gone and nothing on TV, I took a walk to the east of my condo. It certainly felt dark enough – I couldn’t see my feet, but the lights from the resort across the road interfered. I continued further, cricked my neck upward and kept hoping. Porch lights and trail lights diffused the night sky, so I headed back in frustration. Here I was in northern Arizona, far from city lights, in the boonies really. I went to bed disappointed. At 4:30am something woke me, and I stretched and turned toward my open window, glanced at my cell phone for the time, and got up. I put drops in my blurry eyes, padded through the living room and opened the balcony door. It was cold and it felt great and my vision was focusing, so I stepped out and looked up at the black sky – all the lights below me were now off. Forgive the cliché, but the stars were like crystals sewn on a midnight blue satin gown. Clear and vivid, and I felt like I could reach up and touch them. I told myself – five minutes – I have to sleep! The first flash was in my peripheral vision and I wasn’t absolutely certain, but I claimed it. I waited a few moments before the next streaked in front of me. They were tempting me, teasing me – I walked the length of the balcony and back, peering closely into the sky, then sat in the wicker chair for a wider view. Each time I gave up and headed back to bed, another burst streamed and quickly faded. I hate getting old – I knew I had to go back to bed soon or I’d be too awake to ever sleep. At 5:00am I made myself close the bedroom window and the blinds. But I wanted to lie there in the dark and watch for more. I had seen meteors, and they were glorious. 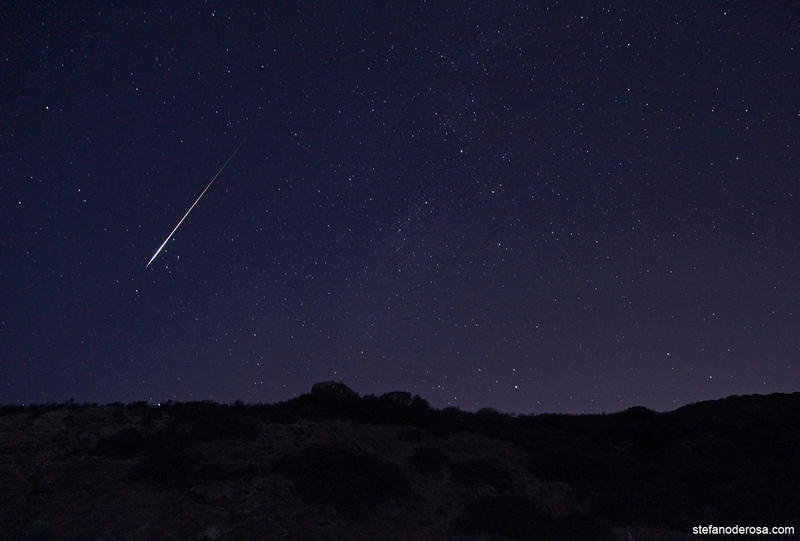 Meteors are like certain people who come into our lives. They shine brightly and light up the darkness. They are beautiful and fun to watch, and they are rare. We wait anxiously for them to appear, to make us ooh and aah, and then they dissipate before our eyes like fireworks and are gone. We are left questioning if we have convinced ourselves of their reality. Had we only imagined their beauty, their light that touched our soul for a moment? They stay in our memory and leave us somewhat bereft. In my life time I’ve had a few human meteors streak across my path. Beautiful flashes of energy that left me longing for more – more time to feel those feelings, more time to be my better self, more time to experience happiness and lightness and love. And at the tail end of those meteors I sat and cried and questioned why it flared and sparked so brightly and ended so quickly. Those few are seared into my memory, and I can “see” them when I close my eyes and bring them forth. As much as I wish I could bring him back, I know the flare has vanished. I will try to wait for the next opportunity, the next person, who will make me feel again. In the meantime, I will relive the experience, feel the sadness of the ending, thank God he flashed through the darkest time of my life, and know that the last eight years were a gift to treasure. This entry was posted in Uncategorized on August 14, 2012 by cwesala.